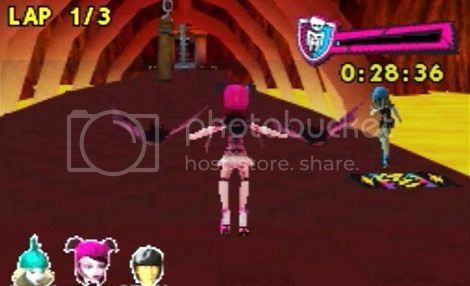 Monster High: Skultimate Roller Maze is the latest video game tie in to Mattel’s toy range and specifically the latest Skultimate Roller Maze doll range. But is it any good? Monster High: Skultimate Roller Maze, published by Little Orbit is the latest video game tie in to Mattel’s Monster High toy range and specifically the latest Skultimate Roller Maze doll range. "What? Who now?" I hear you listlessly murmur. Well, let me explain. Monster High is a doll range by Mattel, originators of He-Man and the biggest toy company in the world. The dolls are basically Barbie as imagined by Tim Burton, featuring characters said to be the offspring of, or in some other way related to, ‘famous monsters’… who of course all attend the same High School. Aimed squarely at the pre-teen market and armed with Tv spots, straight to DVD movies and a web series (what licensed property doesn't have one these days?) Monster High has done well and you can probably find a decent rage of merchandise in your local supermarket. The cynic in me would suggest to you that the MH: SRM game for the Nintendo DS and Wii is just another advertising platform for Mattel. Well that’s exactly what it is - but there are some redeeming features. It seems to make good use of a fairly shallow property, and I think the game will hit all the right notes with its target audience, which (unfortunately) is not me. 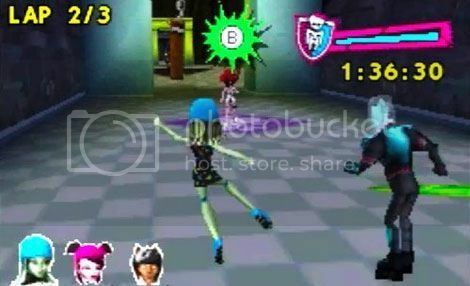 Monster High: Skultimate Roller Maze, you may be unsurprised to learn, is a Mario Kart clone. Since that seminal game's release way back in 1992, before the ‘Goth’ look had been seized by the media and the idea of Undead Barbie dolls on store shelves was inconceivable, there have been many, many repackagings and re-hashings of the original Kart racing classic. In my experience, however, this has not usually been all that bad a thing. With Mario Kart, Nintendo created a format so solid that even when only the barest elements are used, you still end up with a perfectly respectable little racing game. MH:SRM is a such a game, a cute little racing game with what looks like the cast of the truly terrifying We Will Rock You rendered as roller skating teenagers substituting Mario et al. in their Karts. So its roller-skating not karting, but aside from how the character on your screen looks there's not much difference to how you play. Your ‘skater’ controls much like a kart and the tracks, of which there are only a disappointing six, all follow a similar style to those of other games of this type. The menu screens are both pleasing to the eye and easy to use and stick strictly to the franchise’s colour scheme, backed with the only half decent bit of music in the game. They serve their purpose well. There are four different play modes available; ‘Race’ which is a your basic tournament mode, Quick Race where you race against opponents on just one track at a time, selected by you. ‘Relay’ where instead of having three characters to switch between during the race you have one per lap and finally ‘Timed’ you on your own trying to get your best time. I’ll be honest, in the absence of a battle mode I didn’t give anything other than the standard mode much more than the once over. As I mentioned earlier there are only six tracks in the game so the tournament mode is pretty short, all that’s there to extend it are three difficulty settings ‘Spooky’ ‘Creeparific’ and er… ‘Scarifying’. Easy, Medium and Hard to you. After making your selection you then have to choose not one but three skaters from a selection that is expanded by unlocking new characters as you progress. This is an interesting mechanic, and it took me a while to work out thanks to the lack of any real explanation, other than inside the instruction booklet and who actually reads those right? Having three racers you can switch between does add a little depth. As your character starts to tire and slow down you can simply swap to the next one and carry on with the race. Again, much like Mario Kart you can pick up bonuses to help you win the race. These are gained not by racing over a block on the floor but by running head-long into purple coffins that appear in rows across the track. I couldn’t really tell what each pick up was supposed to be, nor could I see many results from me dropping or throwing them. So sadly despite the fact that by swapping racers you can carry one per character, I found little use for them and I didn’t need anything to help me win. Some frustrations arose from poor graphics here and there, this is a standard DS title not a 3DS game and I had a little trouble negotiating some corners, particularly in tunnels as I couldn’t see where the track and the wall were supposed to meet! Other than that, aside from the tracks being a little uninspired in their colour schemes and design, it could play a lot worse for a bog standard racer. Clearly MH: SRM is not a game aimed at me. I've played far too many better versions of it, most importantly Nintendo’s original masterpiece. 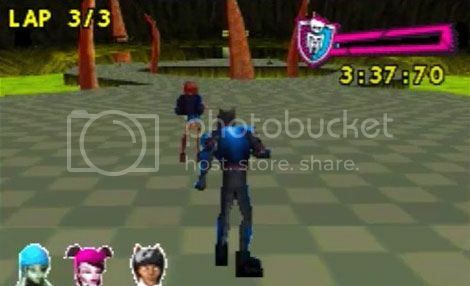 I will say, however, that it is a decent use of the Monster High franchise, and I think that fans will get a lot of enjoyment out of this perfectly playable racing game.